This is my first blog hop and I'm feeling very chuffed that Eleanor over at Seeds and Stitches has invited me to join in. Kaylie over at Kindred Like Me who blogs about books and theatre, her own writing, and her broader journey to shape and direct her life. Kaylie wrote me a poem for a Christmas present once that is still one of the best presents I have ever received. Cheryl at Time to Craft, sharing beautiful pictures, thought-provoking reflections and super simple tutorials for crafting at home, particularly with kids, and slowing down to savour everyday moments. Spinning and patchwork, garden and chooks, and rescuing bats all feature. 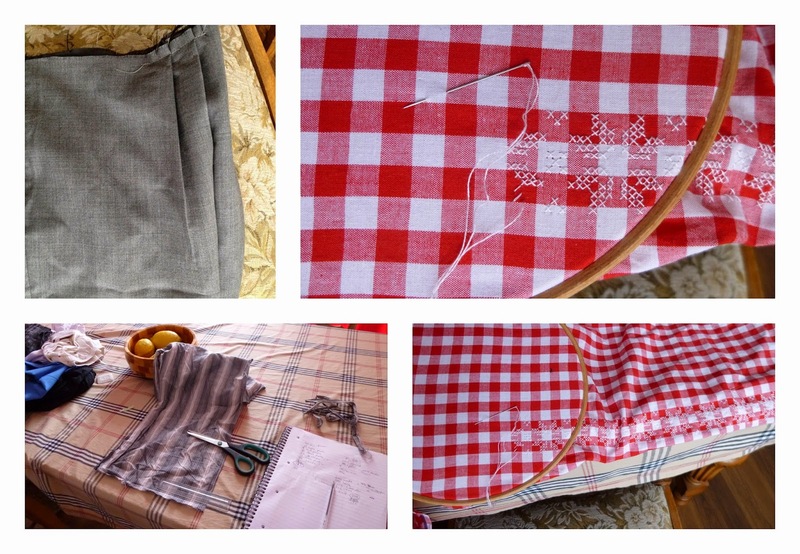 Several projects - a skirt made from a pair of my boyfriend's old trousers, an embroidered table cloth and my first patchwork quilt. I also have several 'in-progress' projects tucked into various cupboards which are a bit stalled. Probably the greatest difference is my tendancy to run before I can walk, and taken on epically huge projects. This embroidered tablecloth is such overkill and will take me months to finish, my first attempt at making a skirt is done without a pattern, just adapting as I go, and my first piece of patchwork is not something small but bigger than two square metres. Why do I create/do what I do? I get enormous satisfaction from making something tangible. A lot of what I do in the day does deliver progress but you can't see it, touch it, use it. Looking around me and thinking 'I made that' gives me a warm feeling on the coldest winter day. 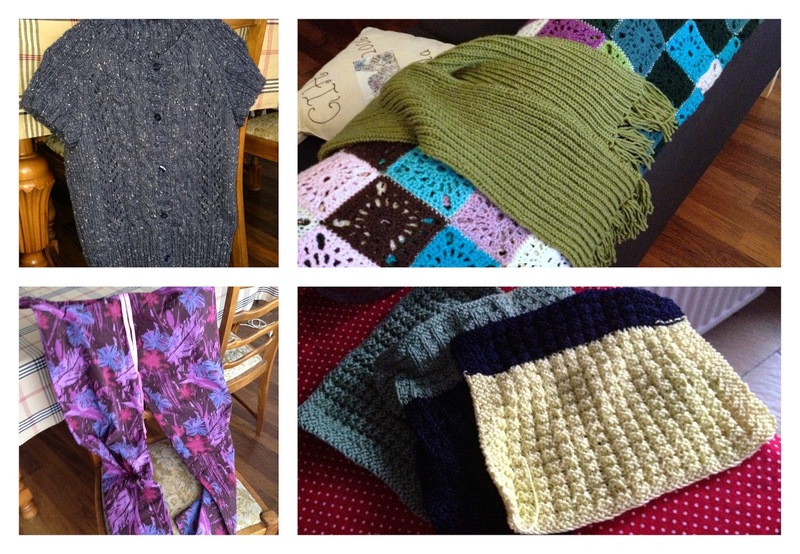 The process of crafting is often therapeutic in itself, knitting, crochet and embroidery help me to slow down and take my focus away from a tv or computer screen. I also like making practical, useful things that are good value for money. I made all the curtains in the flat for slightly over €300 - custom-made, heavy, lined curtains would have cost me considerably more than that. The most satisfying creations are those using scraps, odds and ends - essentially free. These show me that I can fulfil some part of my homemaking dream even while working a busy job - whether that's making dishcloths or a pair of pajamas. Inspiration comes from blogs and pinterest, and from my imagination. I know I should restrain my ambition but where's the fun in that? I plot out what I'm planning to do very loosely - develop an easily repeated embroidery pattern based on more complex examples, calculate the number of square patches for the quilt - but rarely develop a precise and clear plan. This is both a strength and a weakness - I enjoy being able to adapt my plans as new ideas come, but sometimes I can't decide or end up duplicating stages because my ideas change part-way through. Not really a sophisticated process but it works for me.